Today we left Karongwe and travelled along the Panorama Route through the Drakensberg mountains to Imbali Lodge in Kruger National Park. On route we stopped and walked to see the Three Roundavels. 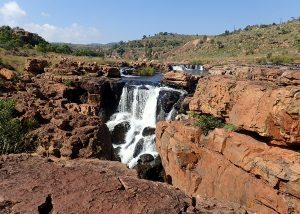 One of the major icons of the Mpumalanga Province. 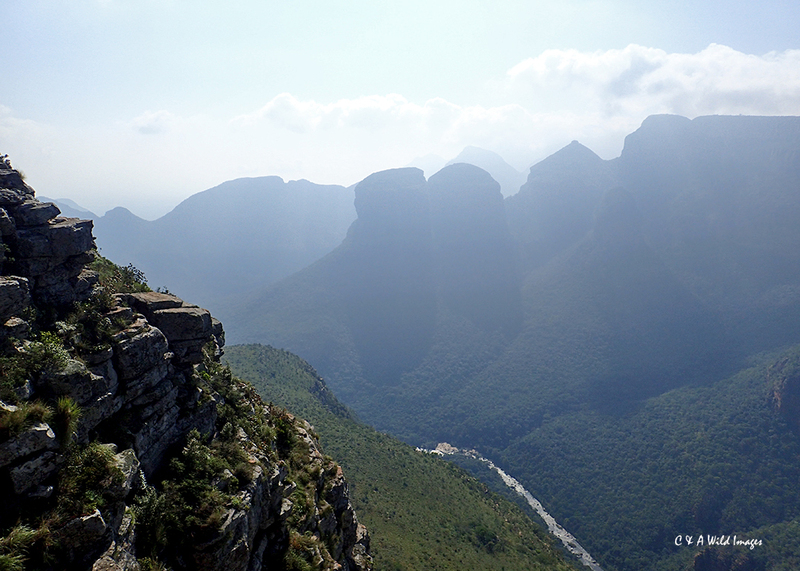 These were three hut shaped rocks towering above the Blyde River Canyon. This is the third largest canyon in the world and the largest green canyon. It was very impressive. 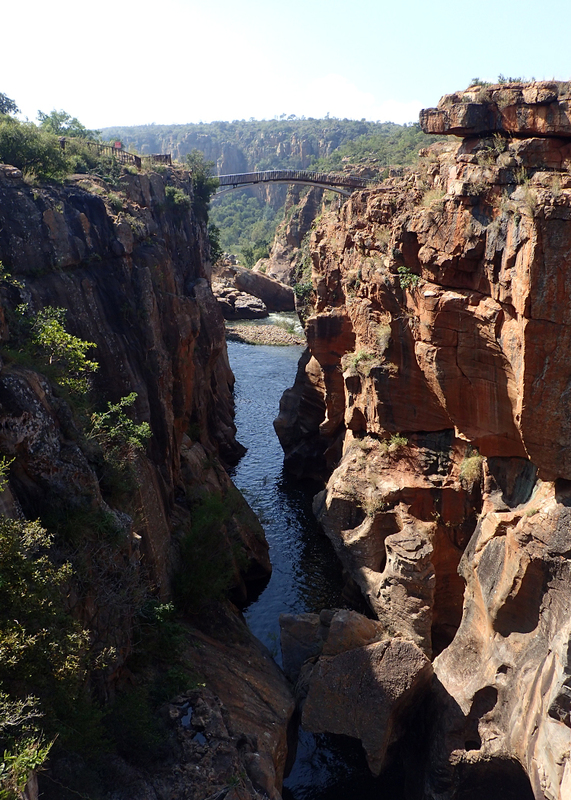 Further along the route we stopped at Bourke’s Luck Potholes on the confluence of Blyde River (the river of happiness) and Treure River (the river of sorrows). Treure River was named by the pioneer settlers after a lot of deaths caused by malaria. 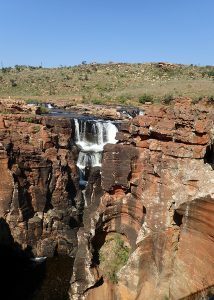 The walk down from the lip of the canyon to the potholes was very scenic. The rock formations with the rushing water following through and around them was amazing. It was well worth the walk down and back up to the top. Our next stop was to see God’s window. 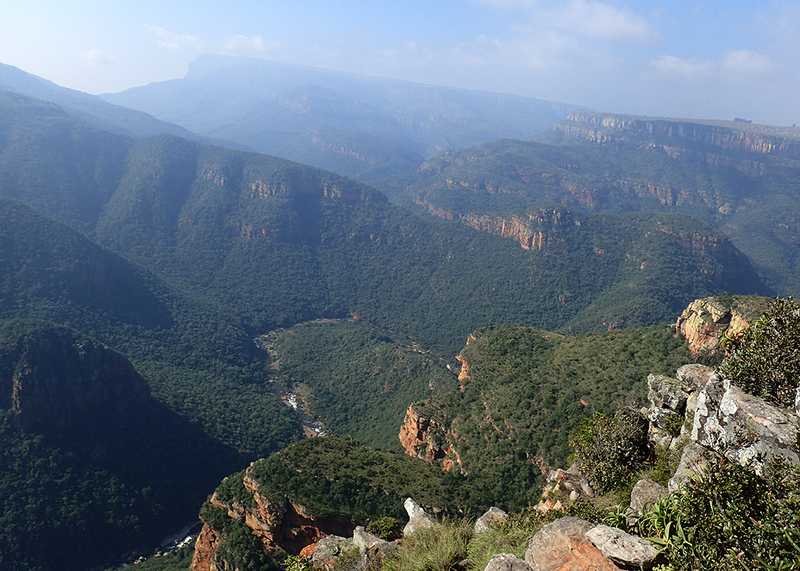 Unfortunately the cloud level had now dropped so the view from across the gorge from the edge was obscured. We then drove through huge plantations of pine trees for the paper industry. Then Eucalyptus trees which where planted for telegraph poles and timber for the lodges. A brief stop in Graskop allowed us to have a comfort break and explore the art and silk shops. 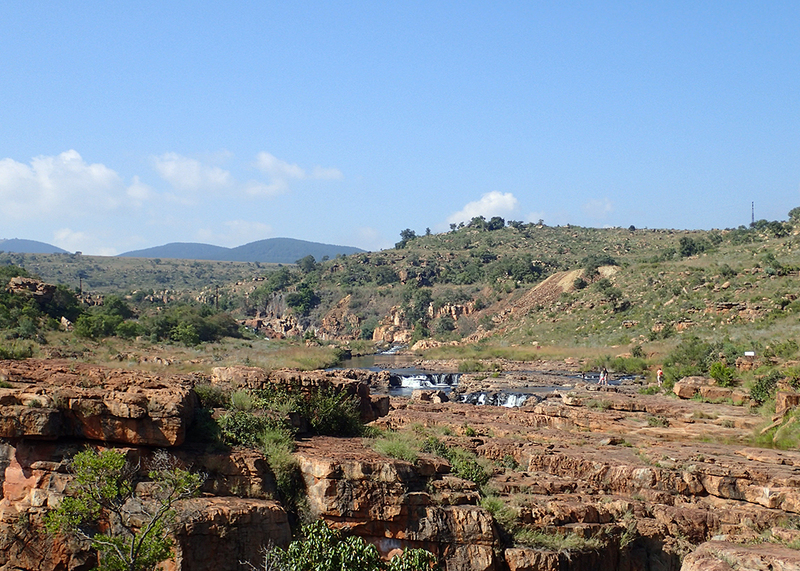 It was then back on the road, travelling along Bushbuck Ridge an extremely heavily populated region. 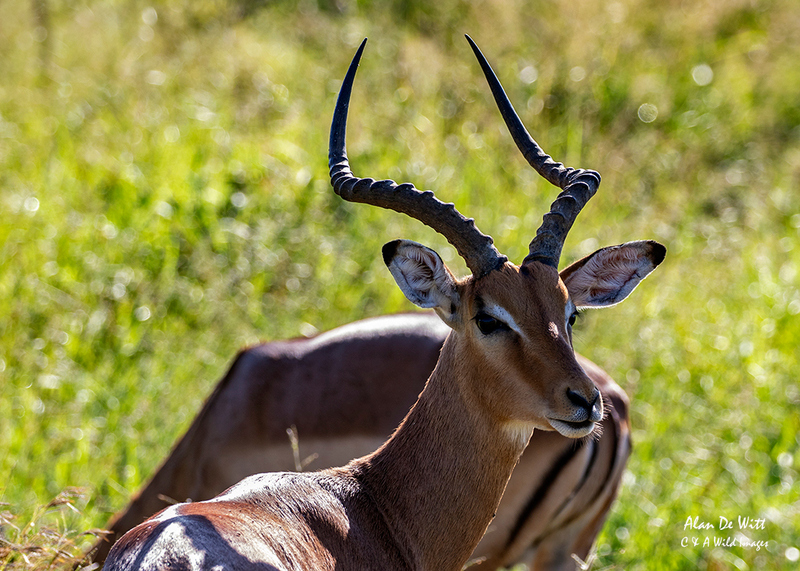 The name Bushbuck Ridge was given because of the large herds of bushbuck found there in the 1880s. 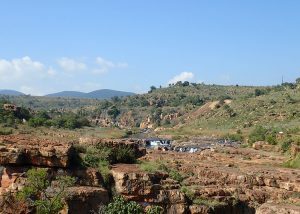 So called “Mandela houses” formed a large part of the townships along the ridge. They were built to house the poor and were originally a basic two roomed house. There were incredible numbers of funeral homes. This was because of the very high incidence of AIDS related deaths. In fact it is running at a shocking 41% of the population. 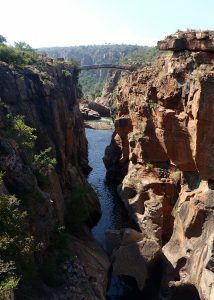 We were to meet our rangers from Imbali Lodge at the Orphen Gate entrance to the Kruger. They brought us lunch and we transferred into the Land Cruiser vehicles while a slender mongoose sat watching. It was then time to head out for our game drive to Imbali LodgeThe route started on a straight tarmac road. 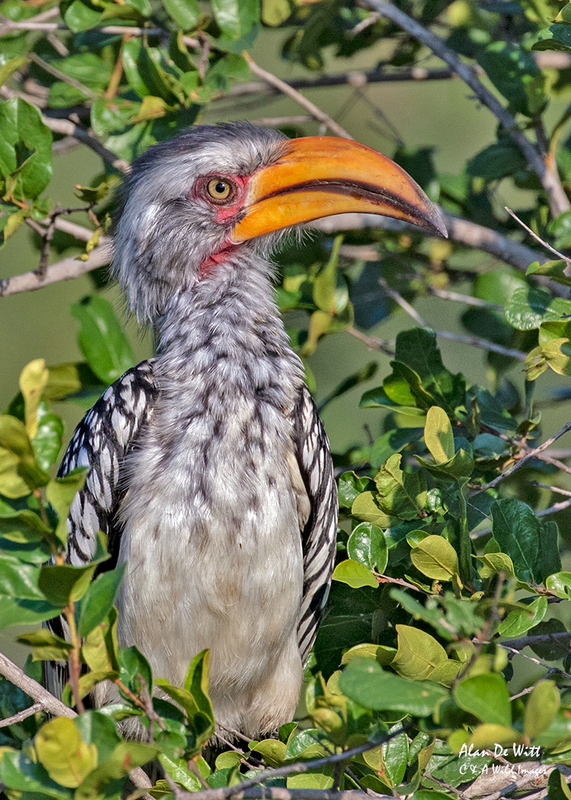 However, game was certainly plentiful with Elephants, Giraffe, Warthogs, Zebra, Impala and Kudu visible along the road. 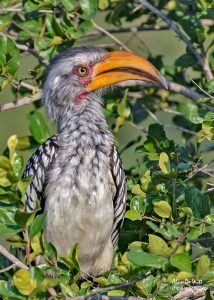 Both Yellow-billed and Grey Hornbills sat in acacia bushes, and the Grey Lori called out incessantly for us to go away. We turned off the road onto the rough, dirt track and Hippo could be seen in a waterhole, where Little Ringed Plover pecked on the muddy shore. Small groups of Wildebeest headed for the shrub and a Lilac Breasted Roller flew, bringing a beautiful flash of colour. A Ground Hornbill stood and stared below a tree where an African Hawk Eagle gazed majestically down from his branch. 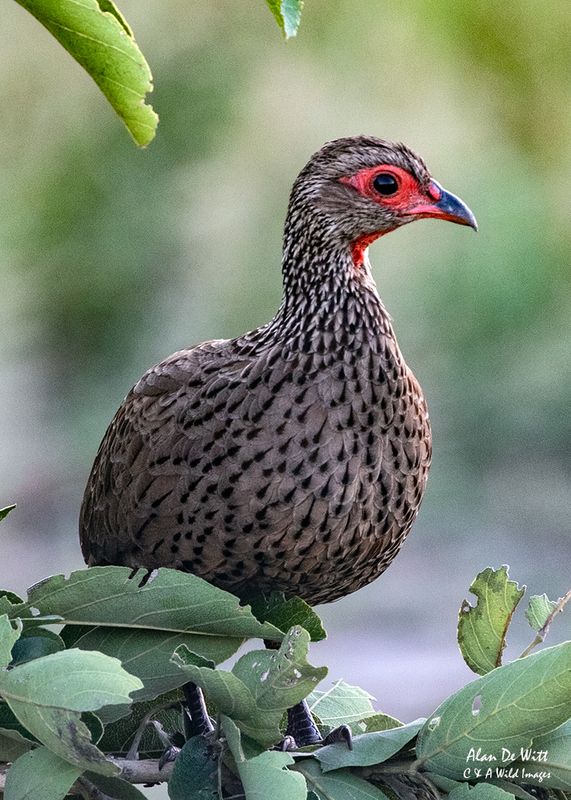 A Grey Duiker hurried into the undergrowth while Doves, Guinea Fowl and Francolin crossed the track in front of us. 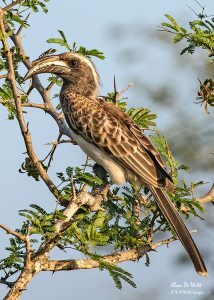 A common sight in the bushes beside the track were Magpie Shrikes and Purchells Starlings. High in a tree a White Headed Vulture was silhouetted against the sky. The sun was starting to set as we encountered a Giant Eagle Owl in a tree beside the track and a Lesser Bushbaby’s large eyes gazed back at us in the torch light. We saw numerous shrub hares dodging for cover as we approached the lodge. 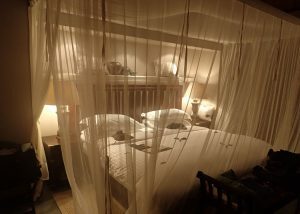 Imbali Safari Lodge is located within the western region of the Kruger National Park, bordering Sabi Sands and Manyeleti Reserves. As we ate our evening meal the rangers reported Elephants were outside the lodge. A guard accompanied us as we left the dining room and headed for our chalet for an early night. 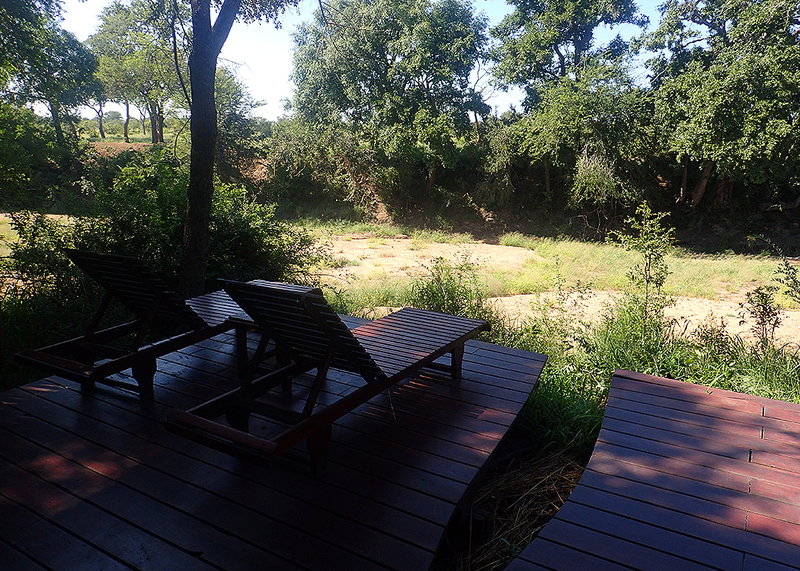 However, it was a noisy night because of the baboons in the trees around the chalet. They where calling out in alarm because of a Lion or Leopard in the vicinity. After an early morning wake up call we headed out to meet up for our morning game drive. There was evidence of the nocturnal activities of the Baboons with leaves, branches, faeces and urine all over the track to the dining area. Members of staff were frantically clearing and scrubbing the pathways in the half light. After a morning coffee and biscuit we headed for the vehicles. 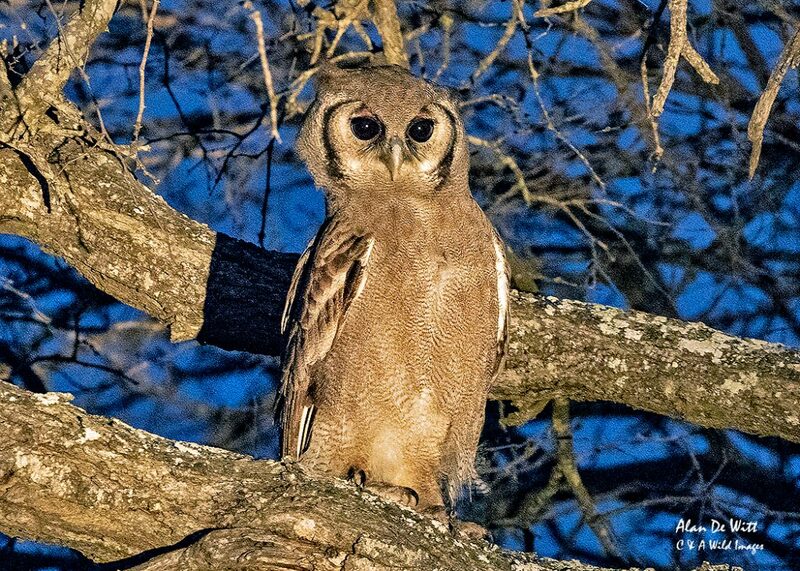 Almost as soon as we left we spotted a Pearl Spotted Owlet, in a tree near the entrance to the lodge. As the sun started to rise we were greeted by the dark silhouette of Ground Hornbills roosting along a tree branch. In the distance we could see elephants and a single male water buffalo. As we drove along the track groups of impala stood and stared and a family of Kudu darted for cover. There was a glimpse of a Grey Duiker before it disappeared into the undergrowth. As the sun burnt the early morning mist away we could see a troop of Baboons grooming each other. A small flock of Brown Parrots flew overhead as Francolins and Red Necked Spurfowl scurried along the track. We drove past a Forked Tailed Drongo, a magpie shrike and a Burchells Starling glistened in the light. On a tree near the track a Lilac Breasted Roller sat and as we tried to take a photograph it turned its back to us. After the morning game drive we headed back for breakfast and a brief rest before lunch. Back at the chalet we discovered a Bushbuck below the terrace watching us curiously before it walked silently into the dry ditch. Alan decided to have a dip in the jacuzzi on our terrace. We decided to put out the trail camera to see if it could capture any more activity around the chalet. It didn’t take long for us to see the usual game. Elephants, Zebra, Giraffe, Impala, Kudu and Baboons where spotted along each side of the dirt track. 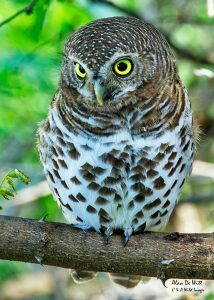 As well as the common birds we had seen on the previous game drives. 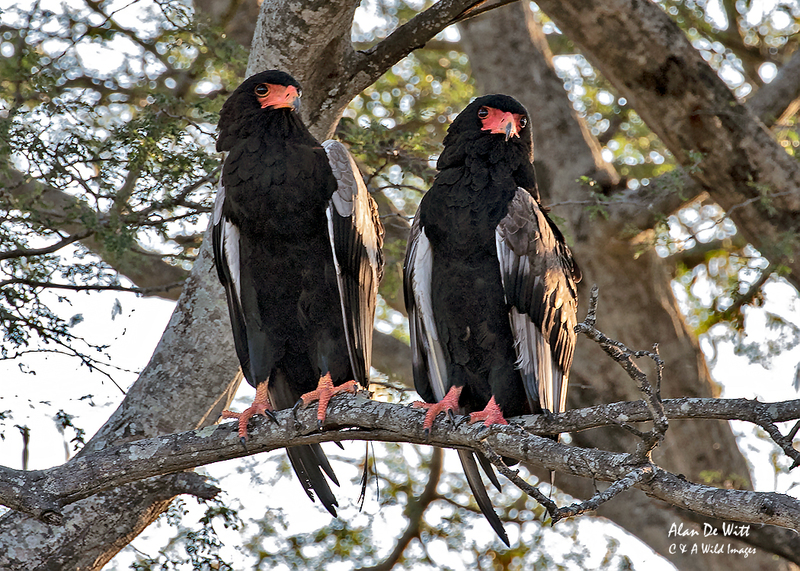 Additionally a White Headed Vulture sat in a tree beside the track and we had good views of two Baleteur Eagles. Next we spotted a Rhino in the bush and decided to have a closer look. 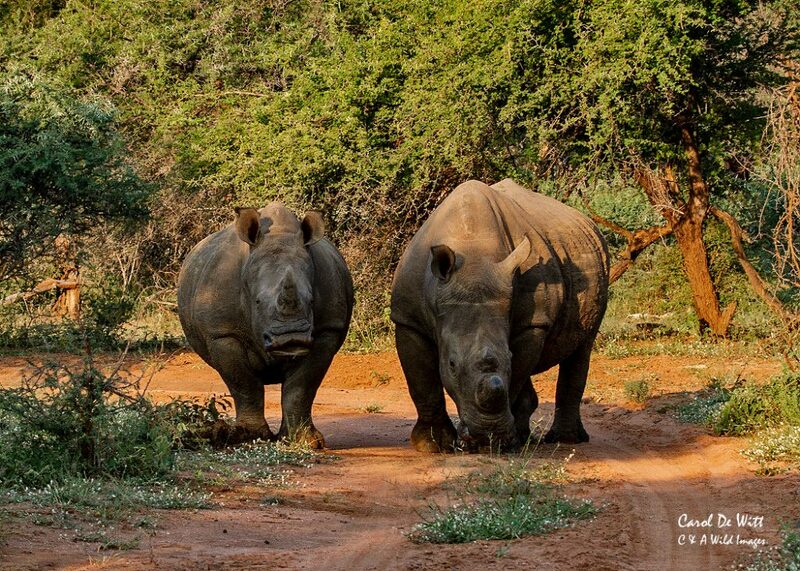 When we entered the bush we discovered two rhino who were walking side by side. One of them appeared to have had his horn cut off. It was amazing to have such a close encounter with these amazing creatures as they totally ignored us and carried on walking. However as the light was starting to go it was time to head back towards the lodge. As we drove along another beautiful sunset showed through breaks in the trees. In the fading light we were lucky to see a Porcupine walking beside the truck and a Shrub Hare darted across the track in front of us. The driver put on his large torch and shone it on the undergrowth. 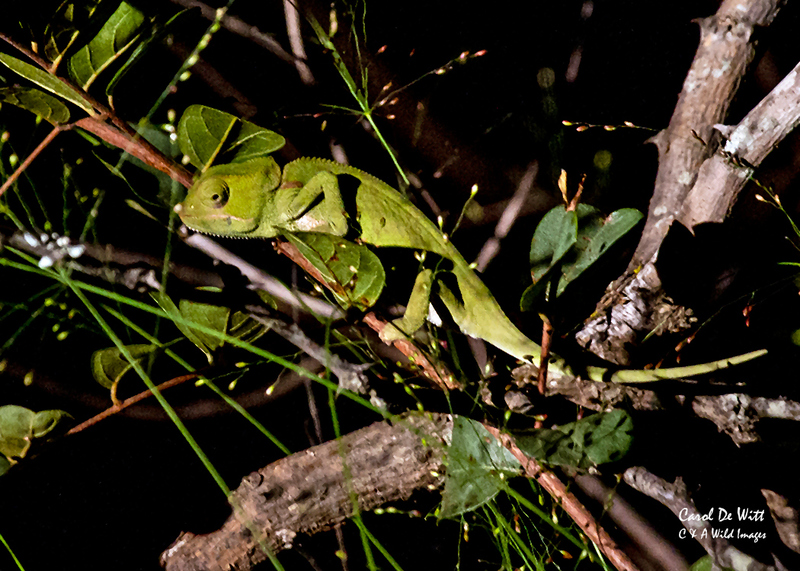 In a bush beside the truck he’d seen a Chameleon. We had good torchlight views and time to take some photographs. 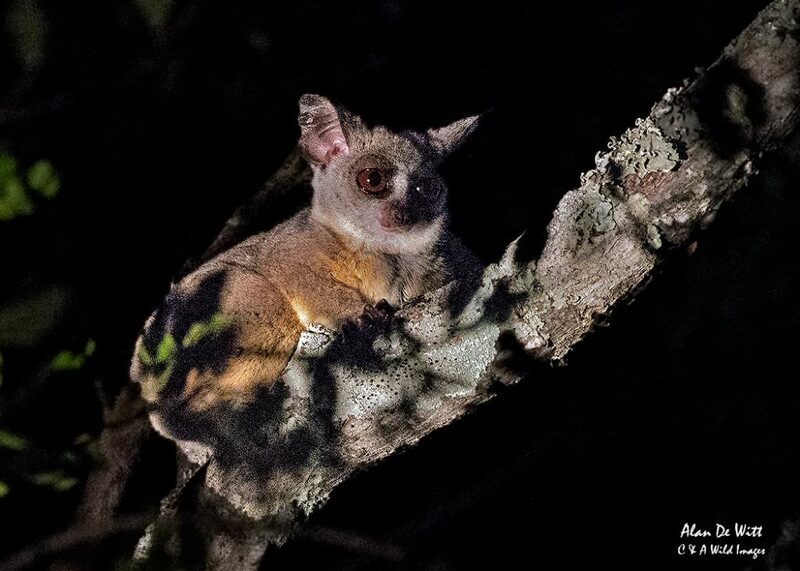 Driving along further the torch lit up another bush, in it sat another Bushbaby. These driver/guides have such excellent eyesight and are so attuned to their environment. They were are able to spot the slightest movement and point out the animal to us. 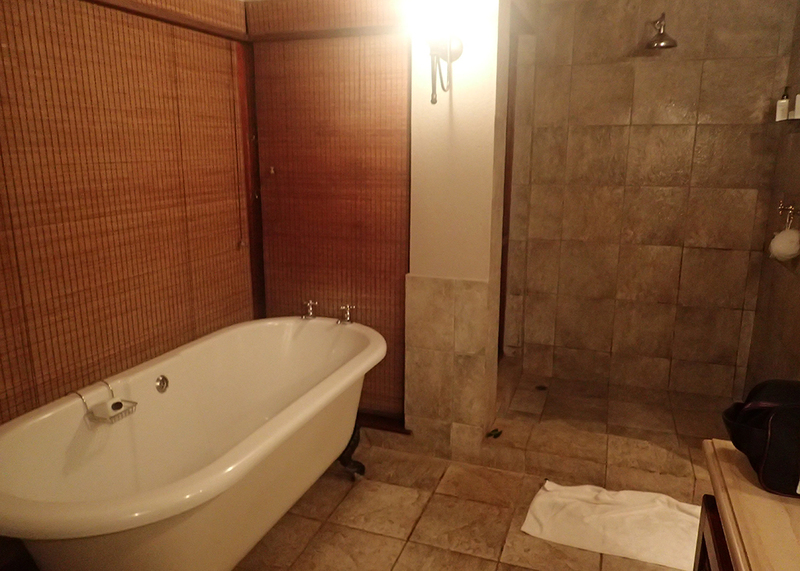 Back at the lodge there was time to shower and change before the evening meal. We had time to check the trail camera and see that it had captured another Bushbuck outside the chalet. It was another delicious meal and an early night, once again disturbed by the Baboons.